“`Only one person is left of the 62 passengers and crew who survived when the Hindenburg burst into flames, 80 years ago. Werner Doehner was eight-years-old, when he boarded the zeppelin with his parents and older siblings after their vacation to Germany in 1937. “`The 88-year-old, now living in Parachute, Colorado, has often recounted the story that the airship pitched as it tried to land in Lakehurst, New Jersey, and suddenly the air was on fire. His mother threw Doehner and his brother out a window; but, his sister was too scared. She perished along with their father. Werner spent almost a year in hospitals for treatment of his burns. <– Herb Morrison’s narration wasn’t heard live that day in 1937, nor was it linked to the film shot by four newsreel crews on the scene. Morrison’s voice was recorded on a transcription disc as he described the airship arrival. The record ran slowly; so, his voice sounded higher when played back. For 40 minutes, he described the tragic situation, only pausing when getting emotional, and when he interviewed witnesses. But, his report was not widely heard until the next day. “`Radio networks had to decide what to air, due to a policy against playing recorded material. NBC played it once, while others used excerpts. No one is certain when Morrison’s words were merged with the film; however, it was long after the tragedy. 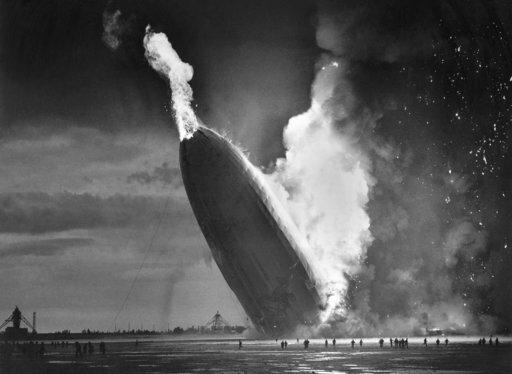 Yet, the Hindenburg became the initial multimedia air disaster of the 20th Century. Put another way, Morrison made broadcast history with the first narrated calamity ever recorded. Oh, the humanity! “`This evening, a ceremony will take place around the crash area. A solemn event is held every year on the anniversary of the Hindenburg disaster. On this day, they remember the men and women who have made the ultimate sacrifice in our military, as well as the 36 deaths, including 13 passengers, 22 crew members, and one worker on the ground. This entry was posted on Saturday, May 6th, 2017 at 12:12 am	and is filed under Blog by Manny Pacheco. You can follow any comments to this post through the RSS 2.0 feed. Responses are currently closed, but you can trackback from your own site.